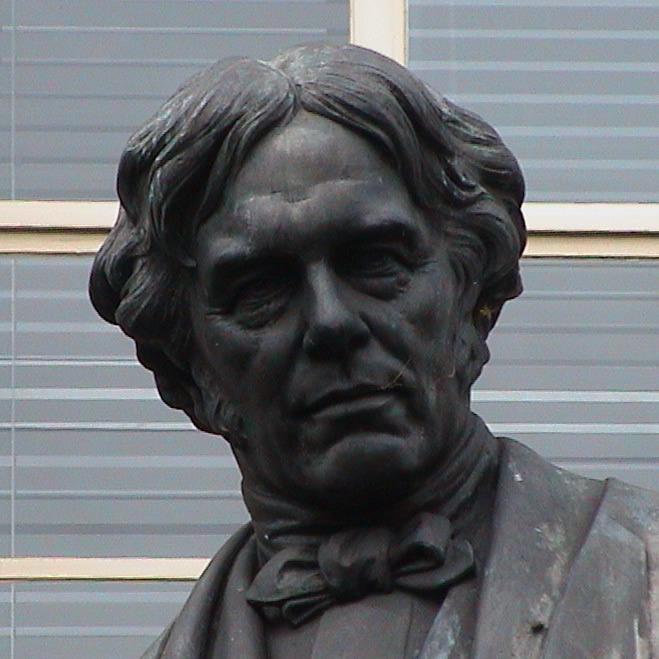 Michael Faraday, September 22nd 1791 - August 25th 1867. Bronze copy of marble original by J. H. Foley 1874 at the Royal Institution Their kind consent is acknowledged. In his right hand he holds an induction ring. The marble original of this statue was made in 1874 and is held by the Royal Institute. Built in 1886 this was originally the joint Examination Hall for the Royal College of Physicians and the Royal College of Surgeons. Its classical facade was modernised in the late 1950s when the top storey was added. High up it is inscribed, "Institute of Electrical Engineers, founded 1871". The IEE, who moved here in 1910, is now (2008) known as the Institution of Engineering and Technology. Unrelated fact: The Bob Dylan video for Subterranean Homesick Blues was filmed near here, at the junction of Savoy Hill and Savoy Row. Thanks to London Daily Photo for bringing this to our attention. Wikipedia tell you more about it but they have the location wrong.